Faverolles are sweet, docile, and personable. In a mixed flock Faverolles chickens usually appear at the bottom of the pecking order. Their non-aggressive manner carries over to people as well. Faverolles chickens accept a newcomer to the flock without fanfare or confrontation. Quiet and calm the Faverolles rooster embodies the very picture of rural repose. They have a lordly appearance but a dignified disposition. By all accounts the Faverolles qualifies as the perfect pet and backyard chicken. Favorolles have ten different plumages; however, the poultry world generally associates Faverolles with the Salmon variety. The hens wear white feathers on the body, breast, and throat. Salmon feathers adorn the top of the hackles, shells, wings, and tail. Faverolles hens look a little daffy with loose feathering, full beards and muffs, feathered feet, and five toes. Faverolles roosters, on the other hand, look altogether different and altogether dignified. 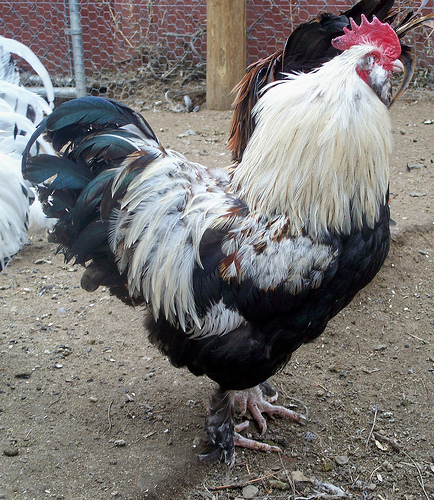 Peter F. Merlin in his article “The Fabulous Faverolles” describes the Faverolles rooster “as the peacock of the poultry world.” The rooster has a iridescent dark breast and tail, white hackles and shell feathers, and bronze wings laced in white. A Faverolles rooster and hen look like an elegant butler accompanied by his brassy, blond companion. Faverolles like to forage. Give them ample room. Poor fliers, the Faverolles need only low fencing to protect them from predators. Keep the run dry. Although they cope well with damp grass, Faverolles tend to suffer from Scaly Leg mite. Feed a good quality layer feed to take advantage of their utility status. They can handle cold weather but will still appreciate a warm coop. Keep Faverolles away from other breeds. Their submissive disposition renders them easy targets from more aggressive fowl.